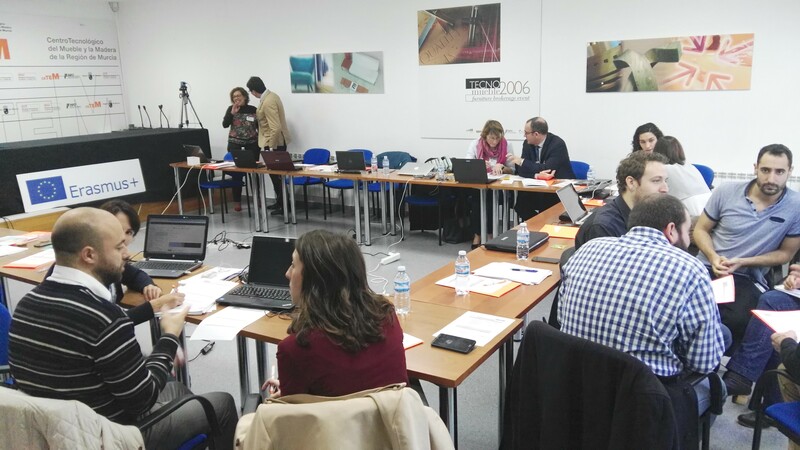 CETEM hosted the Kick off Meeting of the In4Wood project. 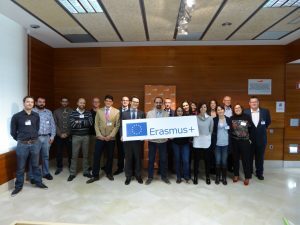 CETEM hosted this week the first meeting for the transnational consortium of the European project IN4WOOD, included in the framework of the Strategic Alliances of the Erasmus + Program, whose ultimate goal is the development of new opportunities of study and vocational training for more than four million people in Europe between 2014 and 2020. Europe is at the beginning of a new industrial revolution, labeled as Industry 4.0. The ubiquitous use of sensors, the expansion of communications and wireless networks, the development of increasingly intelligent robots and machines (as well as the increase in computing powerat lower cost and the development of ‘big data’ analysis) have the potential to transform the way goods are manufactured in Europe. This new digital revolution in the industry brings the promise of greater flexibility in manufacturing, mass customization, increased speed, better quality and, therefore, an exponential increase in business productivity. However, in order to achieve these benefits, companies have to invest in equipment, information and communication technologies and data analytics, as well as to integrate this new flow of production along the global value chain. That is why the European Union and its member countries have strongly opted for this so-called ‘4th industrial revolution’ through a policy of industrial development and by funding research and infrastructure. However, challenges such as the training of workers and future industrial professionals remain. In addition, it has been demonstrated that the furniture and wood sector has a shortage of professionals with high qualifications in ICTs and other emerging technologies. The objective of the IN4WOOD project is therefore to develop a training itinerary adapted to the demands of the growing industry 4.0 in e-commerce, robotics, 3D printing, RFID sensors, modeling and simulation of products, cybersecurity, internet of things and advanced management systems, thus modernizing vocational training and increasing, as a result, the competitiveness of the wood and furniture industry. This alliance, made up of technology providers, education professionals and wood and furniture experts from five European Union countries, will strengthen knowledge exchange, the international labor market and increase the recognition of certifications and Professional qualifications. With a duration of 36 months, the project has a total funding of 1,171,593 €.